We encourage all students and alumni to join us for our 4th annual Biola Startup Competition Workshop #1. This is a unique opportunity for students to practice business as ministry and to work an idea from concept to business plan to pitch for Startup Competition. 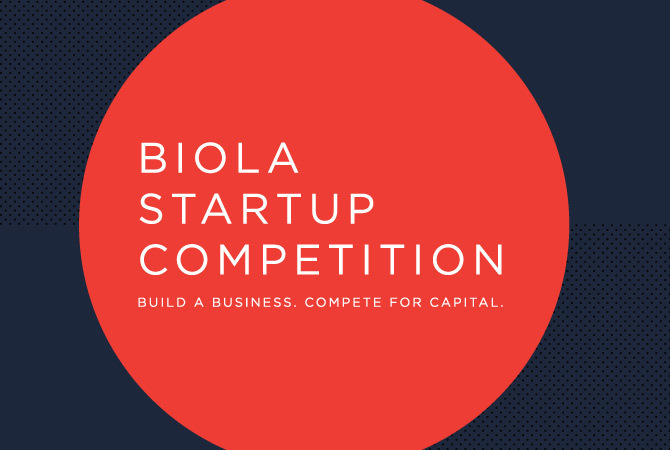 The Startup Competition offers Biola students and alumni the opportunity to transform an idea into a successful company. Participating teams can win up to $15,000 in awards to launch their business in addition to other awards. They are also aided by experienced business leaders throughout the competition. Please check out our website for eligibility requirements. Jeff McHugh’s business experience includes 34 years at Beckman Coulter, a Fortune 500 medical device manufacturer, human resources, manufacturing, Finance, marketing, sales and general management. Over the final 15 years of his career at Beckman, McHugh was the Vice President West Zone Commercial Operations, Vice President National Accounts, Vice President Americas Commercial Operations and Vice President Chemistry/Automation Product Line Division. He earned a bachelor's degree in economics from Stanford University, a master's degree from the University of Southern California with an emphasis in finance and marketing and completed the Stanford Executive Program at the Stanford Graduate School of Business. Jeff taught marketing and innovation at the Pepperdine School of Business for six years before coming to Biola. McHugh currently teaches finance, accounting, leadership/change/innovation and strategic management at the Biola Crowell School of Business. McHugh has been married to his wife for 28 years and they have three children.